For Conor Walsh, there's no example of mechanical design more remarkable than the human body, elegantly and effortlessly synchronising many moving parts at once. But what happens when the brain starts thinking some of those parts no longer exist? Since 2012, in a lab at Harvard's School of Engineering and Applied Sciences, Professor Walsh has been working on an exosuit to help aid human mobility. Initially the project was focused on assisting fully able-bodied people, but in 2014 the team began exploring how it could aid the rehabilitation of post-stroke patients. Though many victims don't die when they suffer a stroke, the damage done to the brain can disrupt signals which leave hugely debilitating effects. Many people don't fully recover to a normal level, but the exosuit presents an opportunity to help train muscles back into healthy patterns, and may one day help many of these people live a more normal life. Conor describes the exosuit as a wearable robot, an example of "soft robotics" in action. The suit anchors itself to different parts of the body using soft materials, while motors and cables work with an algorithm to determine where and when supplemental forces should be applied - helping the muscles and joints move more naturally. "Our goal is to understand the most effective ways to target the deficits for patients with physical disabilities," Conor tells Wareable. "In doing so we can develop effective systems that target the major deficits and thus result in simple and elegant systems that can be lightweight and low power." Think of Iron Man's suit - in a similar way Conor's creation provides an exoskeleton that reduces the effort required to move, but rather than having a hard shell the soft materials are much less restrictive. Essentially it would be more like wearing regular clothes, but the suit wouldn't be worn at all times, just when it was most needed. Testing is yielding promising results, and the project may soon be ready to break out of the lab and onto the bodies of the people who need it most. "For the exosuit project, we have partnered with ReWalk Robotics and are now working together to develop a plan to bring the technology to those who can benefit from it." Conor says. Conor has also just been awarded a Rolex award for Enterprise, with a prize of 100,000 Swiss francs (almost $100,000) that will be a big help in improving the technology, getting it out into the wild, and looking beyond its uses for stroke sufferers. "We initially started developing this technology as part of the DARPA Warrior Web program to assist soldiers to walk long distances when carrying heavy loads," Conor tells us, adding that he can see these systems being used to help people stay mobile as they age. It could also help people affected by other mobility-impairing conditions like multiple sclerosis or Parkinson's Disease. There are many other potential applications beyond healthcare, such as soldiers or manual labourers who would benefit from additional strength. Imagine Ripley's power loader from Aliens but in a more wearable form. And as the technology improves and shrinks, the lighter and more efficient the exosuit will become. For now though it's still making important strides, and in a video we see stroke patients making encouraging headway with the exosuit. Conor hopes to get prototypes out there soon, but important too is that their work encourages others to develop in the area of wearable robotics - "the field is really taking off" - though it's certainly not an easy endeavour. 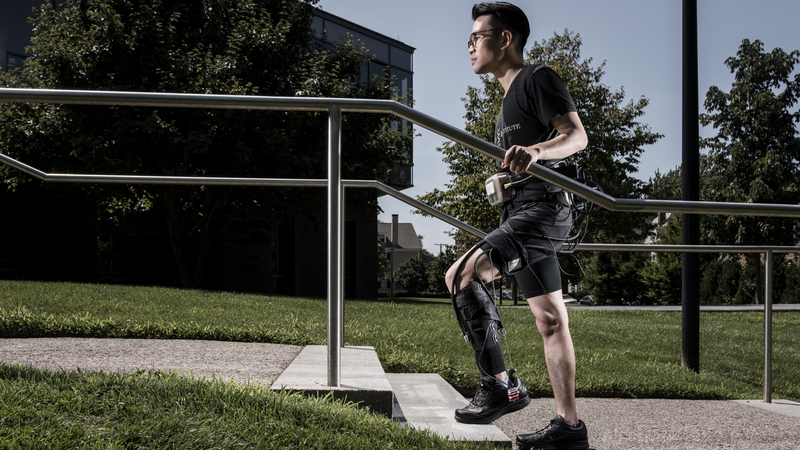 "Developing wearable robots or exoskeletons requires a diverse set of expertise from robotics," says Conor, "to apparel design to human biomechanics and physical therapy". That, and a lot of sewing machines.